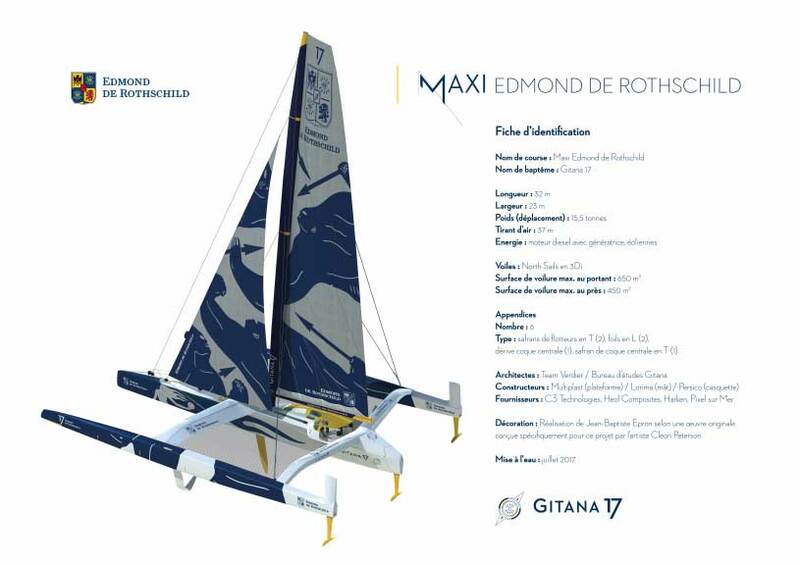 On Thursday, March 30th, the Gitana Team invited the press to the Palais de Tokyo to mark the official launch of Maxi Edmond de Rothschild, a "giant" 32 meters long by 23 meters wide, which is experiencing its last months of construction after more Of a year and a half of construction. The launch of this new Gitana unit is scheduled for July. A review of the general concept, highlighting the forms and architectural biases, focus on the singularities of the platform, not to mention the announcement of the sports program or the discovery of the decoration ... Sébastien Josse and his team have avoided any question, except for the appendices ; A highly strategic point when the displayed ambition is to build and develop a flying oceanic maxi-trimaran. A new chapter in the history of offshore racing is very likely being written. Who could have wagered just ten years ago that a 32-metre long and 23-metre wide multihull would be capable of flying around the world driven by just one skipper ? And yet, this is the gamble accepted by Ariane and Benjamin de Rothschild and the members of Gitana Team, their offshore racing stable founded in 2000. This ‘Ultime’, which has fully adopted a long-term approach with the team involved in extensive research and development on the Multi70 Edmond de Rothschild since 2014, once again testifies to the passion for innovation and performance that guides the owners of Gitana on a daily basis. Designed by naval architect Guillaume Verdier and his team in collaboration with the Gitana design office, the Maxi Edmond de Rothschild is paving the way forward for a new generation of large offshore multihulls. Indeed, it will be part Archimedean boat (submerged hull), part flying craft. Beyond her majestic platform, which is an imposing sight from the first visit to the Multiplast yard in Vannes, the boat features purposeful planing hulls beneath the waterline that are both aggressive and innovative and a far cry from those used on the current fleet of oceanic multihulls. Everything about the forms of the floats and the central hull shouts flight. With this in mind, she will be equipped with the very latest architectural and technical advances in terms of appendages, with T-foil rudders and L-shaped foils, which are sure to set tongues wagging, though Gitana Team does not intend to unveil them prior to the boat’s launch. With everything geared towards flight, a great deal of care has gone into the aerodynamics of the platform. The forms of the beams in particular testify to this, as does the integration of the living space / cockpit between the two beams.